The IBM 9020 is an IBM System/360 computer adapted into a multiprocessor system for use by the U.S. FAA for Air Traffic Control. Systems were installed in the FAA's 20 en route Air Route Traffic Control Centers (ARTCCs), beginning in the late 1960s. The IBM 9020A, for example, was based on the 360/50 and the 9020D used two out of three or four 360/65 processors for flight and radar data processing with two out of three 360/50 processors providing input/output capability. A maximum configuration CCC/DCC complex contained 12 IBM S/360 mainframes. Not all FAA ARTCCs (Air Route Traffic Control Centers), of which there were 20 (plus one in the UK), had the maximum configuration. This schematic shows the maximum configuration, with the mainframe boxes highlighted in blue. There were three operational variants of the 9020 system: 9020A CCC (Central Computer Complex); 9020D CCC; and 9020E DCC (Display Channel Complex). All the 9020A CCCs were attached to a non-IBM display complex, while the 9020D CCCs could be attached to either a non-IBM display complex or to the IBM 9020E DCC. The 9020A and 9020D CCCs carried out flight and radar data processing but needed an attached display complex to provide a plan view display to the air traffic controllers. Each ARTCC had a System Maintenance Monitor Console (SMMC) that brought together the status indications of the installed 9020 system(s) as well as related components, such as environmental systems and communications links. A maximum configuration CCC/DCC complex contained 12 IBM S/360 mainframes. Not all FAA ARTCCs, of which there were 20 (plus one in the UK), had the maximum configuration. The 9020As and 9020Ds were in service in North America until 1989 when they were finally replaced by IBM 3083 BX1 mainframes as part of the FAA's HOST Computer System (HCS) upgrade. The 3083s in turn were replaced with IBM 9672 RA4 parallel processing servers during the FAA's Host and Oceanic Computer System Replacement (HOCSR) completed in 1999. One reason for the 1999 upgrade was concern, probably unfounded, that the IBM 3083's microcode would not operate properly in the year 2000. At least during the first phase of the upgrade, the 9672s were running the FAA's original assembly language code in System/360 emulation mode. Because of the failure of the FAA's Advanced Automation System (AAS) project, the 9020E Display Channel Complexes lasted well into the 1990s. NATS in the UK had a 9020D system in service running NAS from 1974 to 1989, at which time NAS was rehosted on to an IBM 4381 system. This system was known as the Host Computer System (HCS), and it retained the System/360 technology Peripheral Adapter Modules (PAMs) from the 9020D. 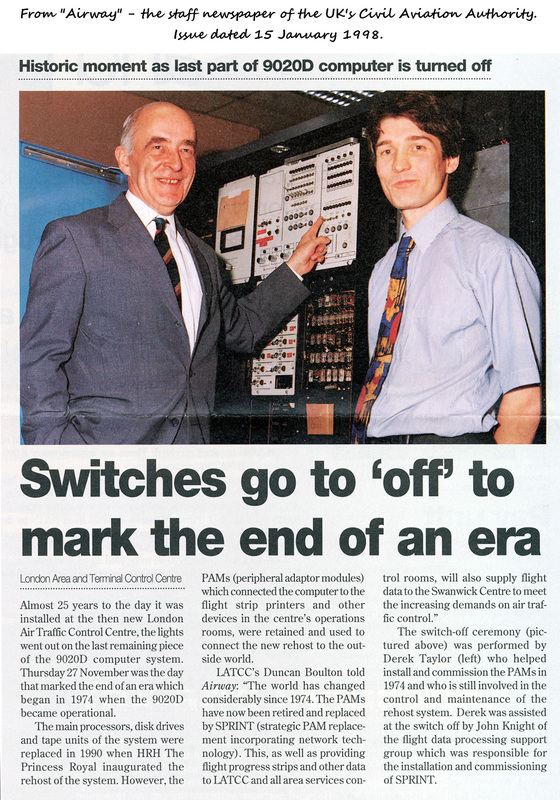 The three PAMs (IBM 7289s) were switched off for the last time 27 November 1997 when their replacement (SPRINT) came into service. ^ "Advanced Automation Program HOST Computer System Acquisition Phase Acceptance Test Report" (PDF). August 1987. ^ a b "Air Traffic Control: FAA Plans to Replace Its Host Computer System Because Future Availability Cannot Be Assured" (PDF). May 1, 1998. This page was last edited on 16 March 2018, at 00:34 (UTC).